The new XC60's exterior is athletic, subtle and timeless, Volvo says. Volvo hopes that by making its new XC60 bigger, safer and more technologically advanced it will be able to surpass the success of the current model, which finished 2016 as Europe's best-selling premium midsize SUV. Volvo has packed the second-generation XC60 with new safety technology that provides the driver with automatic steering assistance or support to help avoid potential collisions. Two of the new advanced driver assistance features are standard in every XC60. The first is an upgrade of the SUV's City Safety system to include steering help at speeds of 50 kph to 100 kph when automatic braking alone would not stop a collision with another vehicle, pedestrian or large animal. The second is a new system called Oncoming Lane Mitigation, which helps drivers avoid collisions with vehicles in the oncoming lane at speeds of 60 kph to 140 kph. The system alerts a driver who has drifted out of a lane and automatically steers the driver out of the path of any oncoming traffic. A third safety technology, which is optional, is called Blind Spot Information System. Along with alerting a driver to the presence of a vehicle in the blind spot, the system has been upgraded to steer the car back into its own lane and away from danger. 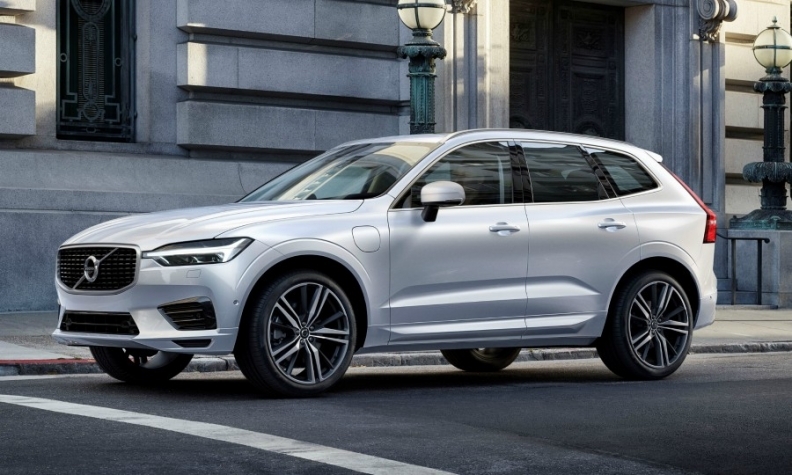 The new XC60 has an electro-mechanical rack and pinion steering system that delivers high precision at all speeds, said Per Ola Fuxin, senior director of driving dynamics at Volvo. "There is a faster connection between the steering and the wheels. That makes the car more responsive to the driver's input, which helps boost the driver's confidence," he said. Fuxin said that the XC60's double wishbone front suspension also helps make the driver feel more in control because the car remains parallel when cornering. Volvo made the new XC60 44mm longer (4688mm), 108mm wider (1999mm) while reducing the SUV's height by 55mm (1658mm). Despite the changes, the XC60's weight is either 20 kg lighter or 20 kg heavier than its predecessor, depending on the powertrain. This was achieved through extensive use of lightweight materials such as aluminum and hot-formed boron steel. Hybrids from the start: The XC60 will be the first Volvo with a plug-in hybrid powertrain available at launch along with gasoline and diesel engine variants. The plug-in hybrid is the most powerful and most fuel-efficient model in the XC60's lineup, providing a combined 407 hp (320 hp from its gasoline engine plus an additional 87 hp from the electric drivetrain) while consuming 2.1 liters of fuel per 100 km and emitting 49 grams of CO2 per kilometer. Engines: Volvo will offer two diesels with power ranging from 190 hp to 235 hp and a pair of gasoline engines that offer 254 hp to 320 hp. Clever solution: The XC60 debuts two thin, wide storage pockets under the back seats that are big enough for an iPad or a small laptop computer. Volvo says the feature has undergone crash tests. What's good: The vastly improved responsiveness of the steering makes cornering more enjoyable at high speeds and makes entering a parking space easier. What's bad: The safety systems that assist when crossing over a lane marking can apply a bit too much torque on the steering wheel.